More than a Desk for you and your families and friends! Are you still complaining unhealthy workstation? Sit to work for eight hours? Let us help you have a healthy working solution now. Sit or Stand depends on your choice. Full Satisfactory Customer Shopping Experience is our priority, thank You for shopping with us. If you have any questions about this product by SMONET, contact us by completing and submitting the form below. If you are looking for a specif part number, please include it with your message. VersaDesk 48" Power Pro by VersaTables - Push Button Motorized Height Adjustable Standing Desk. Electric Desk Riser with Keyboard Tray. Black. 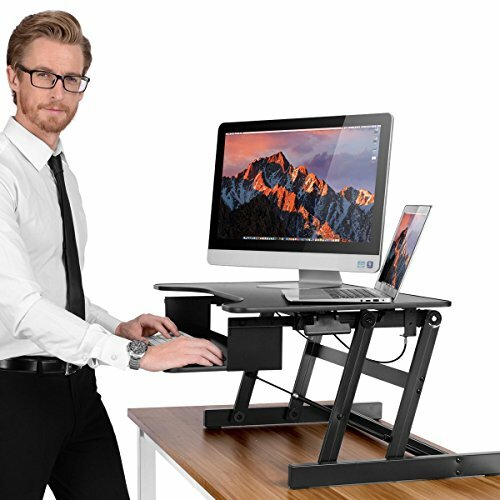 VersaDesk 40" Power Pro by VersaTables - Push Button Motorized Height Adjustable Standing Desk. Electric Desk Riser with Keyboard Tray. Black.